Trailhead is on Mountain Road in Newbury, NH. Mountain Road leaves Rt. 103 0.8 miles east of Rt. 103A in the center of Newbury. The trailhead is 1.2 miles down Mountain Road. Park in the small pull-off at the third stream crossing from Rt. 103. Mt. Sunapee, home to the Mt. 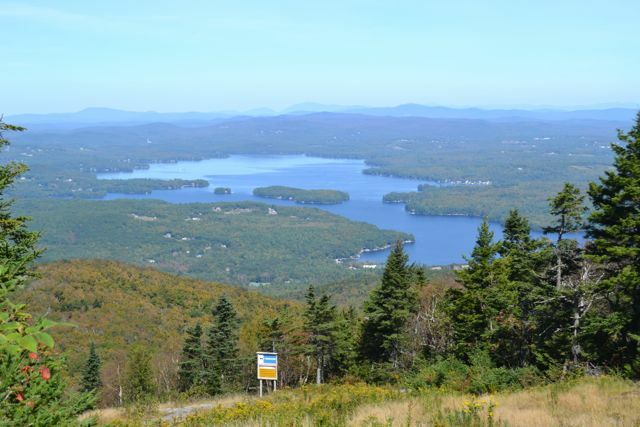 Sunapee Ski Area, also has a network of hiking trails on the side not occupied by ski trails. A popular place to hike is White Ledges, which overlooks Lake Solitude. From there, you can continue to the summit, where views are found from the ski trails. For a shorter hike on Mt. Sunapee, see Mt. Sunapee South Peak. This hike starts on the Andrew Brook Trail, which follows Andrew Brook to Lake Solitude. The trail starts out fairly level, crossing Andrew Brook two times in the first, and gradually becomes steeper and rockier as it ascends. In another half mile, it again crosses Andrew Brook, and makes a final crossing 0.4 miles after that. 0.6 miles after the last crossing, the trail reaches Lake Solitude. Lake Solitude is a small pond set in a plateau under the beautiful backdrop of White Ledges. Follow the trail as it heads by the north end of the pond and to a trail junction. Turn right onto the Monadnock-Sunapee Greenway/Solitude Trail, climb steeply, and in another 0.1 miles, turn left to stay on the trail where Newbury Trail turns right. Just past this, look for a large rock clearing on the left and walk out to the White Ledges viewpoint. The cliffs, almost the same height as the summit, have a beautiful view to the east and over Lake Solitude. Their view is just as nice as the view from the top, so you'll want to spend some time here. Continue on the flat, winding Solitude Trail as it leads 0.8 miles across the ridge. The trail ends at a ski trail, so you must walk a short distance up the ski trail to get to the summit. The summit has many directional viewpoints to the north from the ski trails. The main feature of the view is Lake Sunapee and its surrounding towns. You can also obtain a view from the deck around the ski lodge at the summit.